G-R Manufacturing’s slice shear force kit is used in preperation of the slice shear testing process and consists of three separate components: (1) sizing box, (2) slice box and (3) the double-bladed knife. Each accessory can be purchased separately or all together as one kit. An operator uses the sizing box in order to attain the correct size of the cut needed for testing. 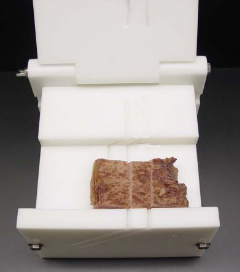 They then place a cooked steak into the slice box and use the existing slits on the side walls and top of the box to guide the double-bladed knife through the steak. This allows for evenly and consistently cut steaks every time. The sizing box is used to prepare a 5 cm wide sample which can then be placed into the slice box to obtain the final sample for testing. 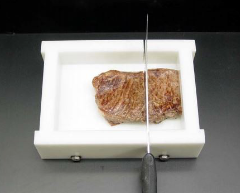 The slice box enables a 1 cm slice to be removed from the sample to be used in the slice shear process to determine tenderness. The double bladed knife blades are spaced 1 cm apart to provide the appropiate sample size. 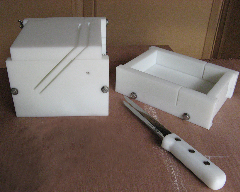 The kit contains all three items described above - the sizing box, slice box and double bladed knife.